Explore the generous compensation package offered to ninja burger employees! 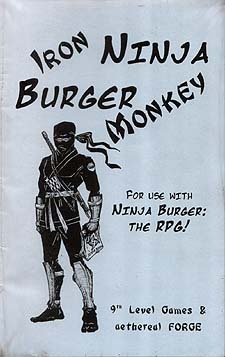 In Iron Ninja Burger Monkey, Ninja have the opportunity to advance both their personal and professional goals. Whether your Ninja is looking for a new, flashy weapon or the prestige of a promotion to Assistant International HR Director - Iron Ninja Burger Monkey has them covered. Brand new (old) weapons, new (ancient) equipment, new Wujenitsu, perks for completing deliveries, and more dishonourable disgraces than you can shake a monkey at. And if all that wasn't enough, Iron Ninja Burger Monkey makes coffee* and sends Ninja back in time to protect the Time-Space continuum. Please Note: this product does not actually make coffee.